Exclusive content, that only you as an email subscriber will get. Make you aware of new product releases that will help you and your blog. Don’t worry, I’m not one of “those” internet marketers. I only promote products I personally use and get benefit from myself. The best part? The newsletter is free! Ok, well not entirely, you do have to give me your email so I can send you the newsletter. But you have my word, I will never abuse your email, share it with anyone else, or use it for any other purposes. 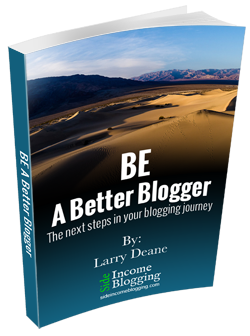 You’ll also receive a copy of my FREE eBook: BE A better blogger – The next steps in your blogging journey. This eBook shares a number of steps you can take to help you and your blog be better. Also, while I would hate to lose you, you can easily unsubscribe at any time using the unsubscribe link included in every newsletter I send out. No strings attached.